It has been said that it is a crime to not prime. It may not be officially listed as an illegal activity but once you start using a primer of any kind, you won't want to go without it. A primer's key purpose is to make your makeup, whether it be base or eye, stay in place for longer. They can also be skin smoothing, add a touch of radiance or even minimise pores. 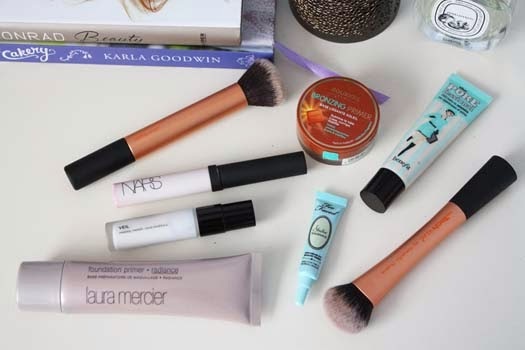 Primers can change the way your makeup looks and lasts on the skin so they're an essential part of many a makeup routine..
Bourjois Bronzing Primer ASOS seem to have taken this primer off their site so I'm hoping it gets added back because I love this. This primer was labeled as an alternative to the popular Chanel cream bronzer. I know some people like to use this as a cream contour as well. While it is way too dark for me to contour or bronze with, I like to apply a small amount of this after using a regular face primer. It gives your complexion a bit more warmth without leaving you looking orange. I have used this as a primer as well and liked it as one. Nars Smudge Proof Eyeshadow Base This is the best eyeshadow primer that I have tried. It has a wand applicator so you can apply this to your lids and then use your ring finger to gently pat it in. Apply eyeshadow as normal and it will stay put so much better. The primer really stops your eyeshadow from creasing. For extra longevity apply a cream base, like a Mac paint pot first. Laura Mercier Radiance Primer If you're not so big on dewy finishes, a primer like this one can be the perfect way to make you look more awake. I typically prefer a more matte finish but applying this leaves your complexion with such a pretty natural glow. I've not tried any of Laura Mercier's other primers but this one has more of a cream, almost gel-like consistency. It's really easy to blend and again, your makeup will stay put with this underneath. Benefit The Porefessional Primer* Benefit's primer is labeled as a pro-balm said to minimise the appearance of pores. It has quite a silicone texture which leaves your skin with more of a matte finish. I like this primer but don't love it, simply because it does not last as well as some of the other face primers I own. I find myself having to touch up my makeup more often. If you've got oilier skin though you may like this primer-dry skintones beware because it can be a bit drying. Hourglass Veil Mineral Primer, Travel Size This is my favourite primer that I own, aside from its nasty price tag. In saying that, I have had this primer for nearly six months now and have only used a quarter of it so it lasts a long time. The texture of this primer is partway between a cream and a gel. It applies really smoothly to the skin and leaves your skin feeling so soft. It also manages to blur imperfections which is common across a few of Hourglass' products. What makes this my favourite though is that it is so long wearing. Foundation lasts so much better with this underneath and there is minimal need for touchups. Love. Too Faced Shadow Insurance I raved about this primer in Friday's post. Compared to the Nars offering, this is quite creamy. As it is flesh-toned it makes a great base, especially if you don't have a neutral cream base on hand. This primer is fairly long-wearing, although after wearing shadow for eight hours on Saturday I noticed my eyeshadow had creased by the time I got home. That may have been because of the heat, not the primer though so I will keep you posted on its lasting power. Do you use a Primer? Which is your favourite?